Precious Blood Sister Joyce Ann Zimmerman, a veteran author who has written extensively on liturgy, recently published a book on Sisters of the Precious Blood spirituality. 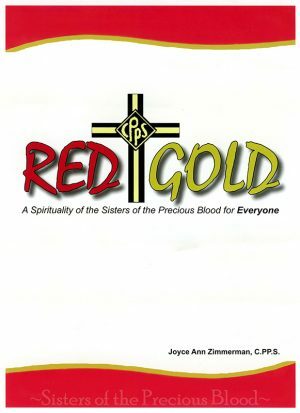 Entitled Red + Gold, A Spirituality of the Sisters of the Precious Blood for Everyone, the text is designed as a guidebook for readers to understand Sr. Joyce Ann’s perspective on the Sisters’ unique expression of their spirituality. The publication is divided into five sections, each with four 2-page meditations. The meditations, which cover various elements of the spirituality, can be read independently. Each meditation ends with three statements that enable readers to reflect on how the meditation is implemented in their own lives. In the book’s introduction, Sister Joyce Ann explains that the Sisters’ expression of Precious Blood spirituality is based on both Jesus shedding His blood on the cross as well as the Precious Blood that is given daily in the Eucharist. The Congregation’s rich tradition of Eucharistic adoration – which was the center of Congregational founder Maria Anna Brunner’s prayer life – shapes the Sisters. Some of the areas discussed in the book are spirituality, adoration, suffering, salvation, life, glory, sacrifice, self-offering, generosity and justice. The project came about during a discussion between Sister Joyce Ann and Don Rosenbeck, administrator at Maria Stein Shrine of the Holy Relics. They were talking about new merchandise in the Shrine’s gift shop when Sister Joyce Ann suggested a book on spirituality to help pilgrims to the Shrine gain a deeper understanding of why the Shrine is part of the Congregation’s legacy and ministry, Sister Joyce Ann wrote in the book. Sister Joyce Ann, who has written about 30 books and 200 articles, did the layout and design work herself, including scanning the artwork. The book is available at the Maria Stein Shrine Pilgrim Gift Shop.